It's no secret the Halloween is the greatest holiday of all time in my brain. Costumes, makeup, booze, candy, and no nagging guilt that you're not spending this holiday with family? Made of win, friends. I generally start preparing for Halloween in August, finalizing my costume idea and imagining out the details to be worked out over the following two months. This year, I was in a bit of a panic, as it was late August and no brilliant costume idea had yet entered my brain. Then, thank god, a friend began suggesting silent-film stars for consideration. Now, I normally keep the costume idea quiet until the last minute, so as to make a grander entrance, but I will make an exception this year as I blog the process of going from Idea to Um I Hope This Becomes Reality. 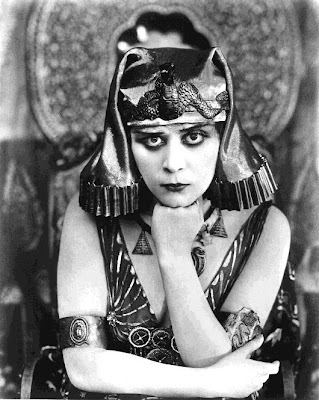 Hint: this year's costume starts with "motherfucking" and ends with "Theda Bara, y'all". Step one: extensive costume research. 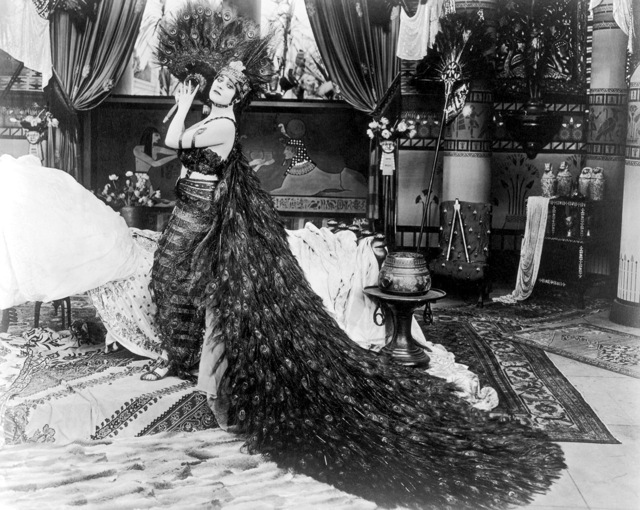 It's a pity that the film for Theda's Cleopatra no longer exists, but stills indicate that the movie featured a dress decked out in peacock feathers. Yes. Oh dear lord, yes. Step two: refrain from cutting my hair until post-Halloween to facilitate a Theda-esque coif. Step three: buy loads of gold and turquoise chiffon. Step four: begin stocking up on serpentine jewelry and gold spray-paint.